Fresco, relief or ornamentation on the clay walls of rural hutments have been a long prevailing practice in rural India. 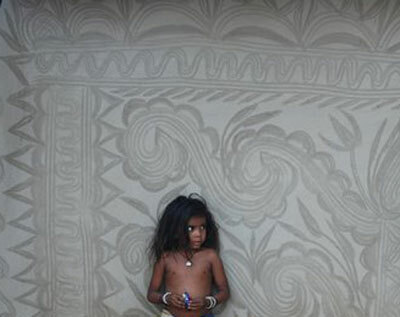 In Bengal, this is known as deoal chitro (wall paintings). Although predominantly found on the walls of the dwellings of the Santal (the largest tribal community in India) communities across Birbhum, Medinipur, Bankura, Bardhaman and Purulia districts in West Bengal, this art form is also practised by other communities residing at the base of the social hierarchy like Dom, Sarak, Bhumij, Kamar, Kumor, etc. As is true of many forms of folk art, it is the rural women folk who are the creators of this ornamentation. 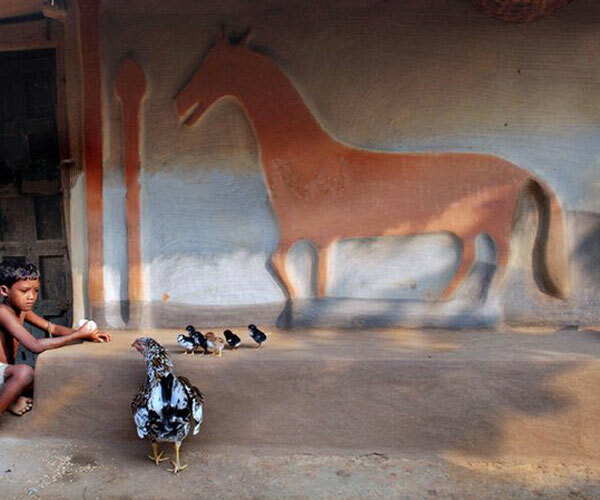 The subjects depicted in the wall paintings are representation of the strong bond between the rural woman and her immediate environment. Banana groves or lotus forms repeatedly visit the creative sphere intermingled with images of domesticated and wild animals and birds – the sum total of which forms the artists’ world. Sometime they also represent a religious belief or perhaps even an abstraction that only satisfies her creative urge. The personal experience of the artist, and her interaction with nature are the biggest influence on this art form. The deoal chitro in the Santal household is executed on two main portions of the hut: the Pinda or the plinth and the Kanth or wall above the plinth.The Pinda or the plinth, generally thicker than the remaining portion of the wall, extrudes beyond the outer walls and is used as a seating arrangement. It is coated thickly with cow dung to give it strength and keeps it from being eroded by water or rain. It is painted black – a colour obtained from burning straw or cycle tyres and mixing the resultant ash with water. To add variety, it is sometimes found that a relief layer of white earth is also used. Pinda itself is not deoal chitra but its importance in creating the diversity of colour and limit of the canvas accounts for its special mention. It is the Kanth part of the wall that is the real canvas for rural ornamentation either as frescoes or as reliefs. Reliefs are created on walls of newly constructed houses while frescoes are painted each year during religious festivals like Sohrai which is the Santal harvest festival or auspicious occasions in the households like marriages or births. According to ancient Santal mythology, their gods Marang Buru (God of mountain) had blessed the Santal people with cattle for agriculture and livelihood. He had told them to respect the cow and bull because the cow provided milk while the bull works hard to support their agriculture. To commemorate this event the harvest festival is celebrated at this time - in October in some regions around Kali Puja and January in other regions. The women of the house clean their houses and decorate their walls with ritualistic Sohrai art. The origin of these paintings can be traced back to pre-historic rock art. Since the wall is the canvas, elaborate layering and preparation is undertaken to give it the proper finish that will bring out the best result of the painting done on it. The women of the community devoutly undertake the entire labour of collecting raw materials and preparing the canvas throughout the year. A coating of "poli mati" is first applied on the wall over which designs are painted. The motifs are usually regular arches, birds, animals, vegetation and various geometric patterns. The colours, mainly white, black, saffron and blue, are natural pigments gathered locally. The design is drawn out with the finger tips and then filled out using fingers, small rags or brushes made from jute fibre. Sohrai wall paintings are often monochromatic but can be extremely colourful as well. Thick coats of clay are applied on the walls. While the clay is still wet, designs are etched using the finger tips. Once dry, these gain prominence and the wall reverberates with life and creative excellence. Attractive bas-relief designs of clay on walls created during the construction of new hutments also constitute deoal chitro. A layer of clay is first smoothed on the wall and a border is made. Inside the smoothened square or rectangular space within the border, a preliminary draft of the theme is visualized and an additional layer of clay is added on that basis. Then with bare fingers or using a bamboo slit, the subject is retrieved in its full grandeur. In some places a hybrid technique of fresco and relief work is used to enhance the overall effect. For example, the body of the peacock is done in relief while the detailed work of its tail is done in fresco. The simplicity with which these wall painters of West Bengal bring out their philosophy makes their creations singular representations of folk art. Unfortunately, little or nothing has been done to recognize this. 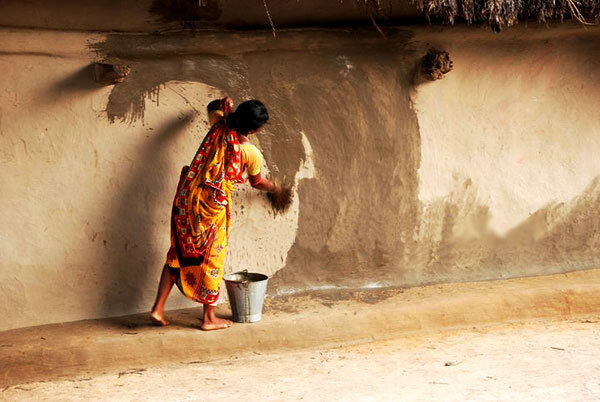 With the increase in urbanization, there are only a handful of villages left where people still paint their homes. 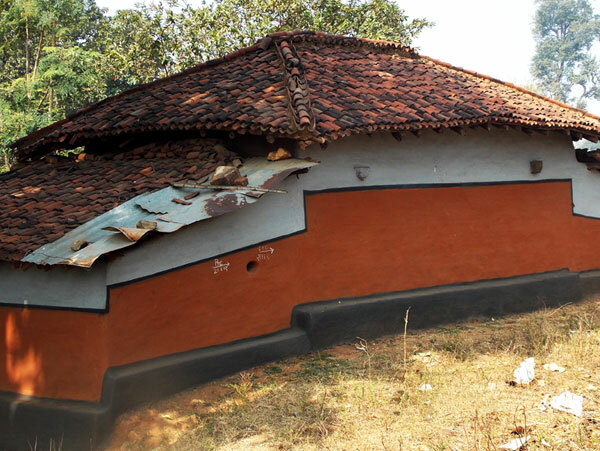 There is a greater incidence of tribal homes in Purulia with painted walls than say the villages near Shantiniketan in Birbhum, or those in North 24 Parganas, nearer Kolkata.